Bundle of Holding has rolled out a classic DeadLands pack as fans get excited for the Xbox Originals series. Perhaps you heard DeadLands was becoming an Xbox series but weren't entirely sure why that was exciting news. If so, simply look to the original RPG, set in a Wild West where monsters, magicians, and the undead are fixtures of the already brutal landscape. It's not clear when the first DeadLands episode will air, but if you simply can't wait, Bundle of Holding will help you explore its world today. DeadLands' classic edition is being featured in the latest pay-what-you-want bundle, compiling a motherlode of resources for players and Game Masters alike. 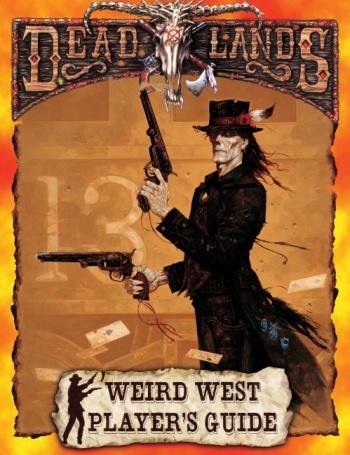 Bundle of Holding's classic collections usually start modestly then add volumes over time, but this DeadLands pack kicks off with nine separate books. The DeadLands Weird West Player's Guide and Marshal's Handbook are mandatory items for starting a campaign. The base bundle also covers with Rascals, Varmits & Critters bestiary and the Smith & Robards equipment book. The Agency: Men In Black Dusters introduces the government agents who protect the Union's secrets. Book O' the Dead expands upon the undead Harrowed with an extensive list of new powers. Fire & Brimstone is a sourcebook for religious characters, complete with new miracles and divine interventions, while The Collegium addresses practitioners of the new mad science. Finally, Canyon O' Doom is a 128 page adventure where heroes must travel through the Grand Canyon, braving the human and supernatural threats lying wait within. Bundle of Holding is promising that even more DeadLands supplements will be added this week, but there's already enough for multiple campaigns. The deal runs until Monday, June 2nd, at which point you'll have to pay regular price or twiddle your thumbs until the DeadLands premiere.